Fannie Buchanan earned a degree in music from Grinnell College, Iowa. During World War I, she organized music and recreation activities with War Camp Community Service. Eventually she joined the Victor Talking Machine Company as a Rural Specialist. As she traveled, she came in more contact with 4-H members and leaders and became involved in the 4-H music program and the needs of 4-H members. She strongly felt that one of these needs was an appreciation for music and singing. During the early 1930s Miss Buchanan authored a column on music appreciation in the National 4-H Club News magazine. 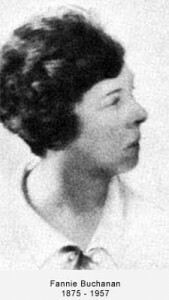 She became the first Iowa State Music Extension Specialist in 1930. Fannie Buchanan wrote the words to five 4-H songs, set to music by her college friend Rena Parish, including “The Plowing Song” dedicated to farm boys and “Dreaming” that captured the daydreams of 4-H girls that she met during her cross country travels. These two songs were introduced at the National 4-H Club Camp in 1927. These two songs were followed by “A Song for Health” in 1929, the “4-H Friendship Song” in 1932, and “The 4-H Field Song” in 1933. The National Committee on Boys and Girls Club Work (now National 4-H Council) published all five of Miss Buchanan’s songs. The members of the Federal Extension Service and National Committee on Boys and Girls Club Work helped to carry her songs throughout the country and encouraged their singing by 4-H clubs. In 1941 Fannie Buchanan authored an Extension music publication entitled, “Music of the Soil.” Miss Buchanan received a citation for distinguished service at the 1941 National 4-H Club Camp and recognition at the closing assembly of the 1944 National 4-H Club Congress. Miss Buchanan lived in Grinnell, Iowa where she died in 1957 at the age of 82. This entry was posted in History and tagged 4-H History, Fannie Buchanan by Larry Krug. Bookmark the permalink.